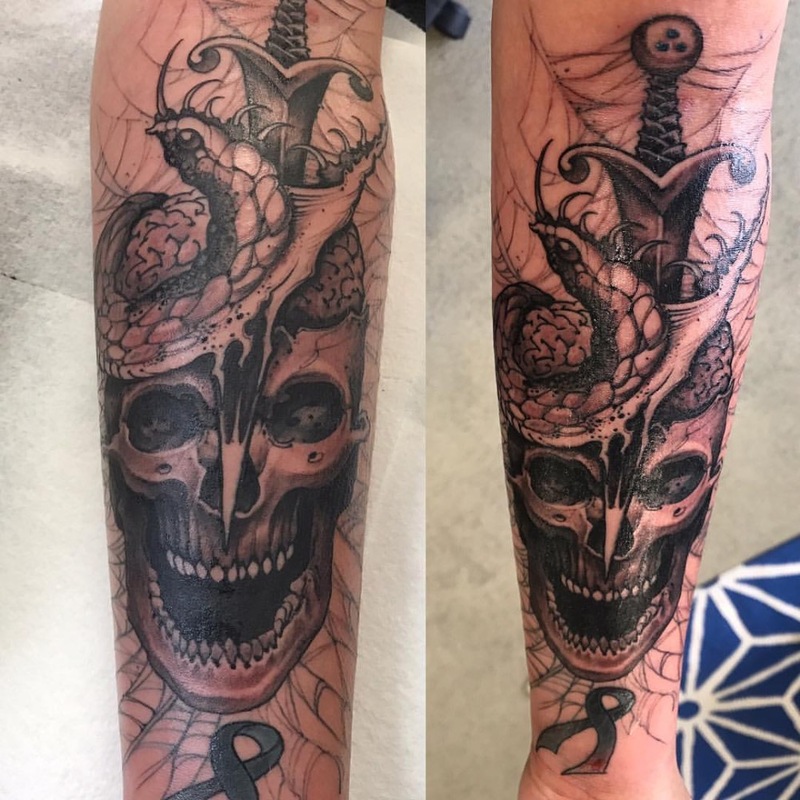 On June 15, 2016, while attending cycling class at her gym, Melonee felt a strange tingling sensation in her left arm, then neck and eventually face. This odd feeling made Melonee attempt to get off her cycle, but prior to being able to, she unexpectedly had a seizure and suddenly collapsed, and went unconscious. Fortunately, someone was able to catch her and led her down to the ground gently. 911 was called and she was rushed to Stanford Hospital. By then, she began to slowly recover consciousness and understand where she was. 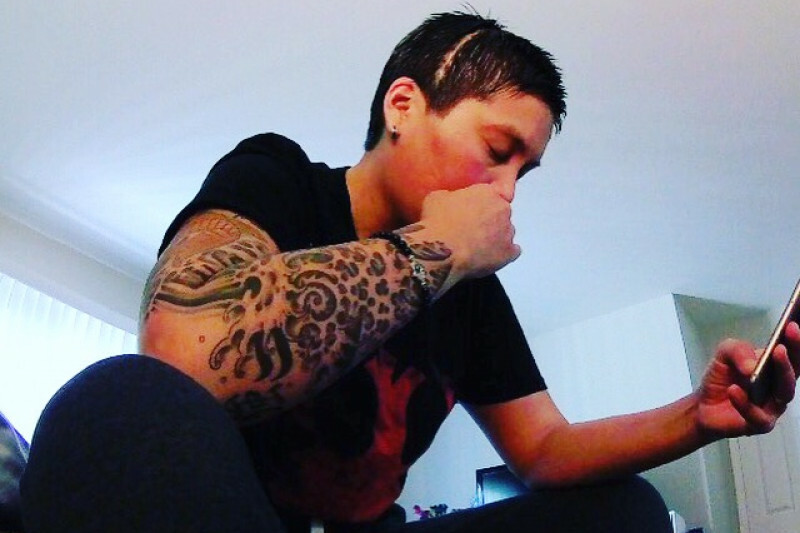 Francine was at her side as Melonee underwent first a CT scan of the brain and later an MRI. It was then that Melonee received the devastating news that she had a large tumor in her brain. After viewing the scan, the neurosurgeon believed the tumor was likely a “Meningioma.” These tumors, as was explained, are in 85-90% of the cases, benign and easily resected. Until surgery, they would not know exactly what they were dealing with. Surgery was scheduled less than one week later at Stanford. Melonee had asked Francine to marry her prior to learning of the tumor. 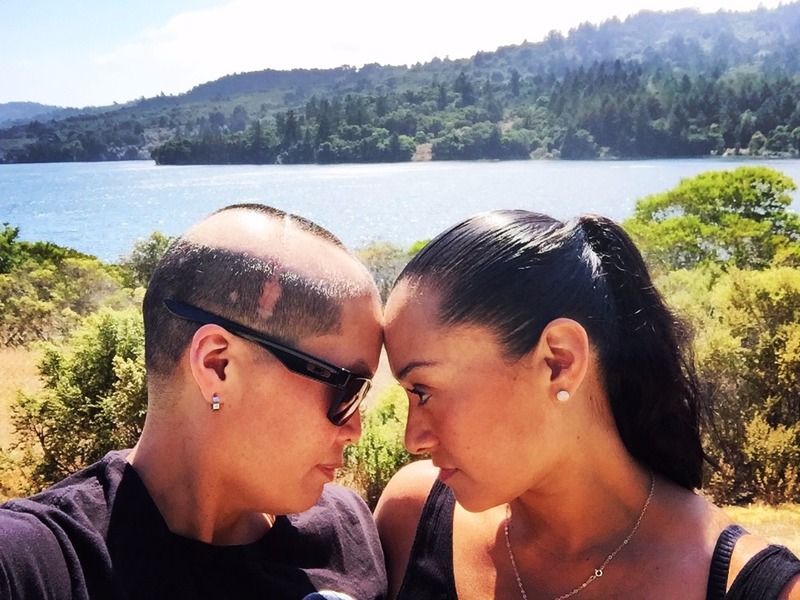 But, rather than wait until the planned event in February, in Hawaii, they instead decided to get married among a small group of friends, in their backyard on June 18th in the week between discovering the tumor and having brain surgery, with the concern of not knowing where life would take them next. Melonee had her brain surgery on June 21st. Sadly, post operative results revealed that things were much more complicated than they had hoped. 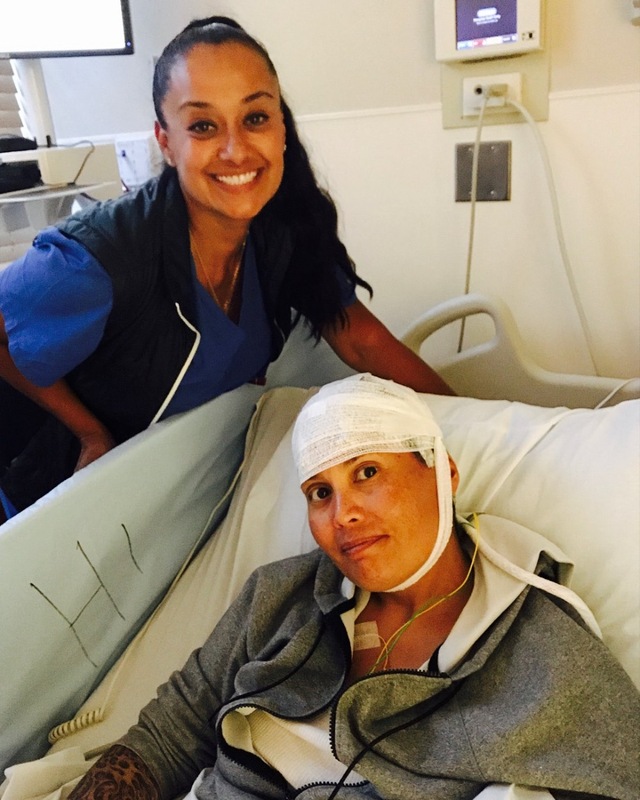 Post surgery, it was revealed that Melonee’s tumor had invaded her brain and attached itself to the motor cortex region as well as the dura of the skull itself, to the extent that the neurosurgeon was forced to scrape the tumor from the dura. Furthermore, the neurosurgeon was only able to remove about 90% of it as the slightest damage to the motor cortex region could mean permanent paralysis on the left side of Melonee’s body. Pathology results presented even more bad news - the tumor fell into the 7%-10% Atypical Stage II Grade tumor, which, by definition, is not benign, and thus, cancer. So Melonee is left with the devastating news that her tumor is not only invasive, aggressive, attached to the brain, Stage II, and malignant, but also they were unable to remove all of it. She was told she should undergo radiation in an effort to contend with the remaining tumor and prevent it from growing. Also, due to the fact that there is still approximately 10% of tumor remaining on Melonee’s brain, she has suffered several seizures since her surgery and is currently under constant concern of suffering from additional grand mal seizures, which, in her case last approximately ten minutes per episode. Melonee’s seizures are still not under control and she is currently also under the care of an Epilepsy doctor, due to their complexity, and to help manage her seizures, and find the right combination of medications to control them so that she may return to living a more “normal” life. Melonee hopes to get her driver’s license and independence back, and get on the road to return to her beloved career in law enforcement and helping others. Once the right medication is determined to control Melonee’s seizures, she will be on lifelong daily seizure medication and twice yearly MRI scans to monitor the return of any tumor growth. Throughout this living nightmare, Francine has been by her side every step of the way. She has also had an outpouring of support from family, friends, and colleagues, something for which she is immensely grateful. On August 1, 2016, Melonee underwent 30 radiation sessions over a grueling period of 6 weeks. She completed radiation treatments on September 12th. Hoping to shrink or eradicate the tumor, Melonee was anxious for her next MRI scheduled for mid December to see what effect the radiation has had. Unfortunately, Melonee’s neurosurgeon broke the news that the tumor was unchanged - it had not grown, nor shrunk. The hope is that Melonee will not have to undergo any radiation or chemotherapy treatment in the future. All the while, and as a result of the surgery and radiation, Melonee was dealing with swelling and excess fluid in her brain causing weeks of excruciating pain and immeasurable exhaustion. To alleviate these symptoms, her radiation oncologist put Melonee on a 3 week course of steroids, which act as an anti-inflammatory, which start high and titrate down. She began the steroid course on January 10th and is still on them as of this writing. Her next MRI is scheduled for March 6th. Melonee has dedicated her life to helping others. She is proud and strong with every intention to beat this thing and hopefully return to the job she loves. In the meantime, her 1 year of cancer presumptive disability is running out and she will quickly burn through her own time. The financial costs have been significant despite her current status as she faces expensive medical co-pays, transportation to and from medical appointments and procedures while Francine is working, loss of overtime and future financial uncertainty. Any financial assistance would be so helpful and believe me when I tell you, it took a lot of talking her into allowing me to start this campaign. Thank you and please consider passing along this page on social media and any other way that may be beneficial. Apologies for letting so much time pass without an update. It is with good reason. Since March, the road traveled by Melonee has been a rough one. As you may recall from the previous update, Melonee began Avastin in March and continued to get those wretched infusions through June. Although they reduced the edema and swelling, they utterly exhausted her to the bone. Melonee would go days on end essentially sleeping and waking only insofar as to eat, shower and let her dogs outside. Mixed in were some aberrant days where she felt pretty okay and was able to embrace life, often indulging in a lunch date with her rock, Francine. Despite the reduction of edema and swelling in her brain, Melonee unfortunately continued to experience seizures, at least one of which landed her in the hospital due to its severity and duration. As an example, she had 5 seizures alone in the month of July. These seizures leave Melonee thoroughly drained and exhausted for days. •	The EEG leads are placed on your head with a special paste called collodion, just like with ambulatory EEG testing. The head (and electrodes) are usually covered by a cap or gauze dressing. 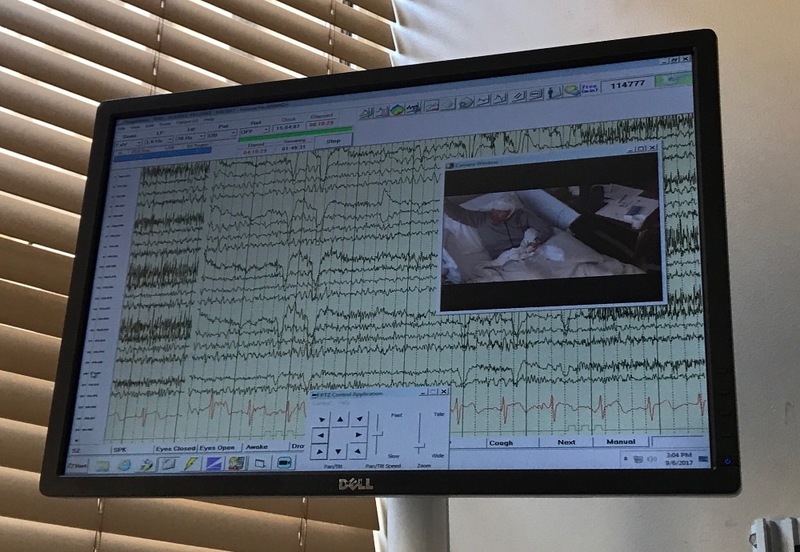 •	Usually, you are admitted to a room on the epilepsy monitoring unit where the EEG, audio and video recording can be done. •	The electrodes are connected to a wire or cord that is attached to a cassette. 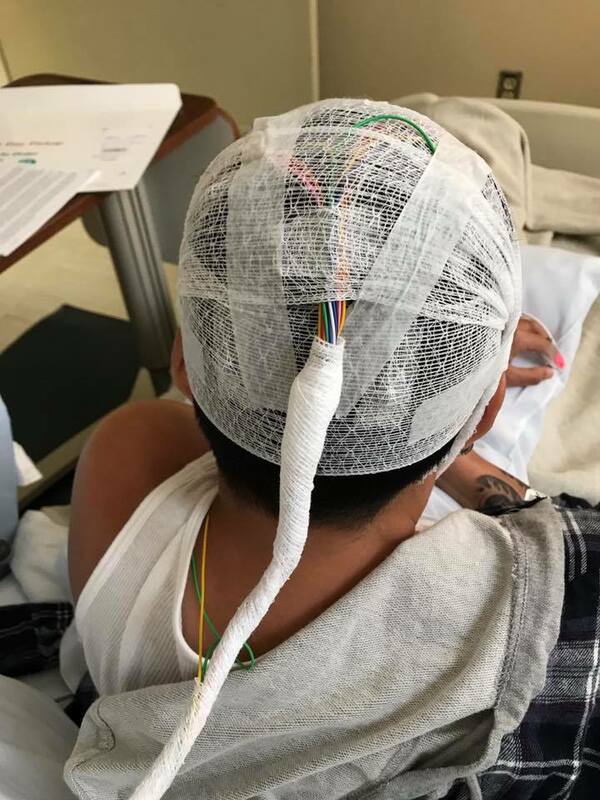 The cord may also be connected to a special EEG connection in the wall or to a nearby machine. Increasingly, wireless systems are being used in monitoring rooms. •	During the monitoring, the epilepsy doctors may lower your medicines to make seizures more likely to occur. Sometimes other things are done to trigger seizures, such as deprive you of sleep, use flashing lights or exercise. Melonee was hospitalized from September 6th through the 13th. She was carefully weened off her seizure medications so her brain could be studied while enduring these brutal seizures. She had 4 seizures that week enabling her doctors to glean the much needed information to hopefully develop a treatment plan to control her seizures. Melonee meets with her Epilepsy doctor on September 28th to discuss the findings in detail. Melonee certainly fears the notion that another surgery may be suggested as a course of action. She awaits her appointment with angst and hope. As always, Melonee is deeply thankful and grateful for all the support she continues to feel in all the many ways so many of you have shown up. Sadly Melonee has had a disturbing setback. On July 4th, she endured 2 hours of a grueling seizure. She was at home, but after it persisted, they made the decision to call an ambulance and Melonee was transported to Stanford Medical Center ER where she has been receiving her care. She spent the night there, on Adavan, to stop the seizure and was released the next day. The seizure she endured was particularly frightening because, not only was it so long lasting, but it presented very differently than the ones she’s had in the past. For example, the movements involved rapid twisting of the head to the left side of her body and for the first time, involved the right side of her body – something new. Melonee’s cognition has been suffering along with her memory, slurred and stunted speech, stiffening of her extremities and failing physical coordination. Her dizziness is so extreme that it has become debilitating. These overwhelming side effects are likely brought on, say her doctors, by the medication changes she is complying with. Melonee’s epilepsy doctor squeezed her in today for an appointment due to this unforeseen change of events. They discussed a plan for moving forward which include, in Melonee’s words, the “dreaded wait and see” approach along with the possibility of video EEG at the hospital in a monitored and controlled setting over a stretch of days, as well as the possibility of yet another brain surgery – not for the remaining tumor, but to address the uncontrolled epilepsy. Melonee is underwhelmed, to say the least, at the prospect of another brain surgery. This has been a hard stretch since beginning of the Avastin and all the hope it promised. Melonee remains strong in spirit and determined. She is also exhausted and eager for a path to healing. As always, she and Francine thank everyone for their outpouring of support, concern and love. She feels indebted to all who have reached out in the many ways so many of you have. Gratitude! I know it’s been a while since last updating. Melonee has had a difficult few months. Since beginning Avastin, along with the numerous and large quantities of seizure medications, Melonee has had a combination of positive news and worrisome side effects/symptoms. The good news first! 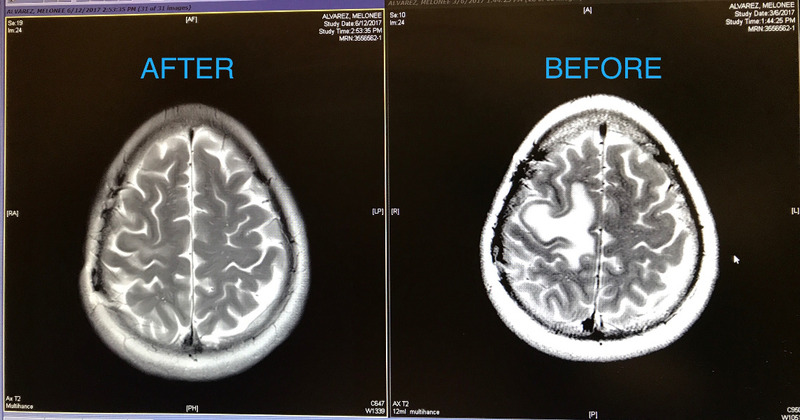 The Avastin has extremely decreased the fluid and swelling in Melonee’s brain as is depicted in the before and after photos. Doctors feel and hope that by normalizing the brain in this way, Melonee will be able to eventually back off on some of the many seizure medications she is on, or at least lower the dosage. The not so great news is that Melonee is experiencing a host of bothersome symptoms, which seem to be getting worse, such as cognitive, speech, memory, word searching as well as a lack of physical coordination, mild dizziness by day and extreme dizziness by night. After she takes her nighttime meds, she experiences what she describes as being drunk or drugged and not necessarily in a good way. The doctors continue to make changes in her medication in an effort to alleviate or minimize some of these crazy making symptoms, while still eliminating her seizures so she can return to work. Also, hopefully, Melonee will have had her last Avastin infusion on June 22nd! Many of you have asked me about donating Catastrophic Illness Program (CIP) hours to Melonee. She thanks you but it is too soon for that. The current status is that as of 6/15/17, Melonee completed her presumptive disability year but has now switched over to Worker’s Supplemental Disability. I don’t fully understand the intricacies of this new status but for now, the state is covering her hours and once that runs out, Melonee will begin burning her own time. Down the road, we will reassess and figure out, in conjunction with Sergeant Pengel, the BSU coordinator for CIP, at which point Melonee should start the CIP process. But we have some time before she is eligible, which is a good thing. Also, let’s hold hope that once the Avastin is out of her body and she has healed from its effects, along with a balancing of her seizure meds, she won’t need to prolong her disability any longer. Melonee continues to thank everyone who has reached out to her both monetarily and otherwise. She is exceedingly grateful and remains hopeful that there is light at the end of her arduous journey. Mel keeping you and Frankie close to my heart during these tough times. You are such a warrior, Mel. I am just hoping things begin to level out. It is a long, hard battle. Thinking of you with so much admiration. Although the message said it was from Alice, it was obviously from Melonee....and warmed my heart. I wish you weren't going through this, but am glad to be in it with you. Pat and I will continue to keep you both in our prayers, keep fighting!! Still thinking of you when you were in GTF and running with the big dogs. Keep on fighting. Just like that. Hi! Melonee Alvarez. May The Most High Creator, Continue To Bless You and Protect You. You Are In My Thoughts And Prayers. Melonee Alvarez. You Are Beautiful, Strong, Brave, And Full Of Grace. Francine , You A Picture Of God's Grace, And Unconditional Love...You Both Are God's Angels...Keep Being The Best Part You...With Love And Grace, Delia Head...Sending You Peaceful Healing Thoughts.